He’s in there. Past the stump field. Through the lily pads. Buried among the weeds. And, he’s taunting you to come get him. That’s when you hit the foot pedal on your Maxxum bow-mount and put the game in your favor. No other trolling motor on the water has the sheer guts and power to take you where the big fish are. The power to tame rough water; push through heavy vegetation; and take the kind of pounding that day after day of hard fishing delivers. Streamlined Foot Pedal — Puts you in complete control. Easy to use and ergonomically-designed for all-day comfort. Pull-pull cables provide reliable, responsive steering. 3X™ Steering —Select models feature our exclusive 3X™ Steering. Move the Tilt Steering Control just 60 degrees to change the lower unit a full 180. Make adjustments in your boat’s position with a minimum of effort. Tilt Steering Control — Telescoping handle extends to 21" and features 5 detent settings for maximum comfort and control. Tiller tilts 20 degrees for maximum versatility. Ideal for steering with your knees when the action heats up (select models). Bowguard 360°™ Breakaway Mount — A Minn Kota exclusive! Breaks away on impact from any direction, protecting your motor, shaft and boat. Get uninterrupted fishing as the motor automatically resets itself. 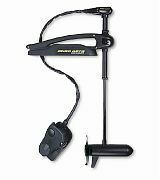 No more leaning over the bow of your boat on your hands and knees wrestling with resetting your motor. Maximizer™ — Get up to five times longer run time on a single charge. Maximizer™ technology controls the draw of power at infinitely variable speeds to conserve battery power and extend run time (select models). Overload Sensing Circuitry — Protects your motor from overheating when accidentally engaged in the stowed position. Rock-Solid Maxxum Mount — The strongest bow-mount system in the world. Go for broke without worrying about breaking down. Stowed, the Maxxum Mount won’t budge, flex or vibrate. Indestructible Composite Shaft - Guaranteed for Life! — Pound for pound, our ultra high-yield composite material has been tested to be three times the strength of steel. Virtually indestructible, it flexes on impact and then returns to its original position. Unlike steel, will not kink, break, rust or corrode. Guaranteed for life! Cool, Quiet Power — Minn Kota’s larger brushes, windings and commutators generate less heat, less noise and run cooler…extending motor life and conserving battery power. You get greater sustained thrust and more time on the water. A unique bearing system produces low rpms/high torque to cut down on fish-spooking noise — so quiet they’ll never hear you coming. Weedless Wedge™ 2 — The latest generation of this legendary design features swept-back and flared blades to “wedge” weeds away. Pass through the thick stuff without battery-draining “chopping and hacking.” A Minn Kota exclusive. 3-Year Warranty — All Maxxum bow-mount trolling motors feature a three-year warranty.